Well, tatawagin ko itong harina diet since ang main kong kain is between lunch and mirienda and i ate pandesal with those. For breakfast- my forever breakfast! Oatmilk! Plus a tea bag later at the office. And i cooked 2 eggs (oo,medyo burnt) in a non stick frying pan. Yes i gave up using cooking oil ages ago. For lunch-well, that pandesal stuffed with eggs i cooked in the morning. 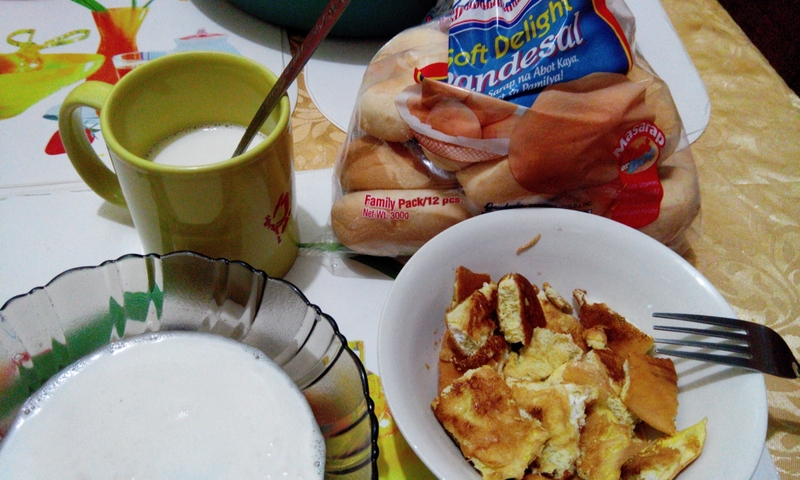 Yes the 2 eggs were divided for my breakfast and my 4 pandesal. For mirienda- our afternoon breaktime is in 4pm, i have pandesal left. Sometimes i ate 2 pandesal for lunch and the other two for mirienda. Sometimes 3 for lunch and 1 for mirienda. I have to eat something in mirienda because i lift in the night. For dinner- i dont eat. No solid food intake. Glass of water or milk or 3 scoops of yogurt. That summarizes the harina thing in my harina diet.